Back row (left to right): Daobilige Su, Jaime Valls Miro, Bradley Skinner, Teresa Vidal-Calleja, Lei Shi (Leo), Liye Sun (Lea), Buddhi Wijerathna. Front row (left to right): Nalika Ulapane, Alen Alempijevic, Gamini Dissanayake, Sarath Kodagoda, Freek de Bruijn, Raphael Falque. Professor Gamini Dissanayake received the Graduate degree in mechanical/production engineering from the University of Peradeniya, Sri Lanka, in 1977, and the M.Sc. degree in machine tool technology and the Ph.D. degree in mechanical engineering (robotics) from the University of Birmingham, Birmingham, U.K., in 1981 and 1985, respectively. He is currently the James N. Kirby Professor of mechanical and mechatronic engineering at the University of Technology, Sydney (UTS), Australia. He has expertise in a broad range of topics in robotics including robot localization, mapping, and simultaneous localization and mapping (SLAM) using sensors such as laser, radar, vision and inertial measurement units, terrain mapping, multirobot coordination for SLAM, target tracking and probabilistic search, motion planning for single and multiple robot manipulators, legged robots and cranes, and application of robotic systems in urban search and rescue. He leads the Centre for Autonomous Systems (CAS) at UTS. Associate Professor Jaime Valls Miro received his B.Eng. and M.Eng. degrees in Computer Science Systems, from the Valencia Polytechnic University, Spain, in 1990 and 1993 respectively. He received his PhD degree from Middlesex University, England, in 1998. His thesis examined the use of dynamics for trajectory planning and optimal control of industrial manipulators. Before joining the Centre for Autonomous Systems at the University of Technology Sydney, he worked for 5 years as a software and control systems analyst in the underwater robotics industry for a London-based company. 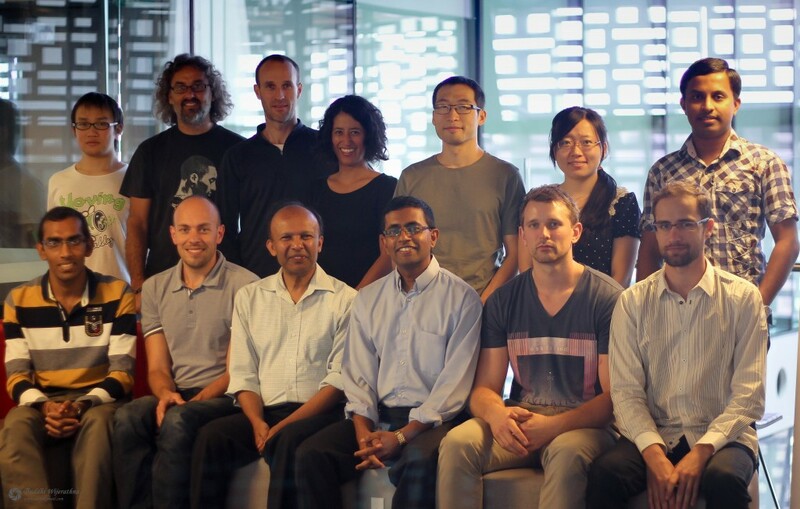 Currently, he is an Associate Professor with the Centre for Autonomous Systems (CAS) at UTS. His research activities include autonomous mobile robot navigation and mapping (in particular in unstructured scenarios such as USAR), visual SLAM, assistive robotics, machine learning and human-robot interaction. He is a member of the IEEE and IET, and committee member and regular reviewer of scientific works published in the top international robotic journals and conferences. Associate Professor Sarath Kodagoda received B.Sc.Eng.Hons. degree in1995, specializing in Electrical Engineering, from the University of Moratuwa, Sri Lanka. He received his M.Eng. (2000) and Ph.D. (2004) degrees specializing in robotics from the Nanyang Technological University, Singapore. Before joining the Centre for Autonomous Systems (CAS) at UTS he worked for two years as a Design Engineer in a reputed multinational company. He is currently an Associate Professor at the University of Technology, Sydney teaching Mechatronic subjects. He has published five book chapters and over 70 refereed journal and conference papers in many areas of robotics. He is an Associated Editor, Programme Committee member and a regular reviewer of a number of top robotics journals and conference proceedings. He is a member of the IEEE. His research interests include social robotics, human robot Interaction, machine learning, perception, target tracking and mobile robotics. Dr Alen Alempijevic received his B.Eng. Computer Systems Engineering with First Class Honours and PhD degree from the University of Technology Sydney (Australia) in 2004 and 2009 respectively. He joined the UTS node of the ARC Centre of Excellence in Autonomous Systems as a Research Fellow in 2009 and is currently a Senior Lecturer with the Centre for Autonomous Systems (CAS) at UTS. Alen has been part of the Australian research team collaborating with University of California Berkeley in 2007 on enabling vehicle autonomy under the Department of Defence sponsored DARPA Urban Grand Challenge. His main research focus is investigating the challenges in perception and application of machine learning techniques on infrastructure maintenance, underground coal mining, human-robot interaction and estimation of biological systems. He is a Member of IEEE and regular reviewer of scientific works published in the top international robotic journals and conferences. Dr Teresa Vidal-Calleja received her B. Eng in Mechanics from the National Autonomous University of Mexico (UNAM), her MSc in Electrical Engineering (Mechatronics options) from CINVESTAV-IPN, Mexico City, and her PhD in Automatic Control, Computer Vision and Robotics from the Technical University of Catalonia (UPC), Barcelona, Spain in 2007. During her PhD studies, she was Visiting Scholar at the Active Vision Lab, University of Oxford, U.K., and the Australian Centre for Field Robotics (ACFR), at the University of Sydney, Australia. In 2008 she was a Postdoctoral Fellow at LAAS-CNRS, Toulouse, France. She went back to ACFR as a Research Fellow from 2009 to 2011. She joined the Centre for Autonomous Systems (CAS) at UTS in 2012 and is currently a UTS Chancellor’s Post Doctoral Research Fellow. Her research interests include robotic perception, automatic recognition, visual SLAM, aerial and ground robots cooperation, and autonomous navigation. She has been a continuous reviewer for leading robotics journals and conferences since 2006. Dr Bradley Skinner received his B.Eng. degree in Computer Systems Engineering with First Class Honours and PhD degree from the University of Technology, Sydney (Australia) in 2002 and 2007 respectively. His thesis examined the use of parallel and distributed genetic-based classifier systems in the robust classification of human EEG signals. Before joining the Centre for Autonomous Systems (CAS) at the University of Technology Sydney, where he is currently a Senior Research Fellow, he worked for more than a 12 years in industry including organizations such as Techway Limited, Telstra Enterprise Services, IBM Australia and their respective clients. His work primarily focused on software systems and infrastructure for commercial level networking and computing systems. His research activities include parallel and distributed search, machine learning, signal processing and point cloud based computer graphics. He has participated as a lecturer and reviewer for leading journals and conference proceedings. Dr Lei Shi received his B.Eng. degree in Electrical Engineering and Automation from Beijing University of Aeronautics and Astronautics, China in 2004, and M.Sc. (Eng) degree in Control Systems from The University of Sheffield, United Kingdom in 2005. Before joining the Centre for Autonomous Systems (CAS) at the University of Technology Sydney, he worked for more than four years in semiconductor and automotive electronics industries. He received the Ph.D. degree in Robotics from the University of Technology, Sydney, Australia in 2014, and he is currently a Research Fellow at the Centre for Autonomous Systems (CAS). His research activities include human-robot interaction, machine learning, sensors and signal processing and statistics. Mr. Nalika Ulapane received his B.Sc.Eng degree in Electrical and Electronic Engineering with First Class Honours from University of Peradeniya, Sri Lanka in 2011. He majored in Electronics and Control theory while working on the Final Year Project of developing a versatile solar panel emulator through parametric modeling of commercial solar panels. This project was honoured as one of the top ten engineering undergraduate projects in the country by the Institution of Engineers Sri Lanka (IESL) in 2011. Before joining the Centre for Autonomous Systems (CAS) at the University of Technology Sydney (UTS) in 2012, he served as an assistant lecturer at the Department of Engineering Mathematics of University of Peradeniya. Currently he is a Ph.D. candidate at UTS and his thesis is focused on better interpretation of Broadband Electromagnetic (BEM) signals employed in non-destructive testing of critical mains. As an outcome of his research, he has developed a probabilistic framework which increases the accuracy of a commercial BEM sensor in predicting average wall thickness of aged ferromagnetic critical water mains. Mr Buddhi Wijerathna received his B.Sc Engineering degree, in Electronic and Telecommunication Engineering with first class honours, from the University of Moratuwa, Sri Lanka in 2011. Before starting his bachelors he achieved Sri Lanka’s best results for the General Certificate of Education (Ordinary Level) countrywide Examination in 2003, and also Sri Lanka’s third best results for the General Certificate of Education (Advanced Level) Mathematics stream examination, in 2006. He became Sri Lanka’s first ever Olympiad medalist (Bronze) in Physics at the 8th Asian Physics Olympiad, 2007 held in Shanghai, China. After a 6 month internship at Zone24x7 (Pvt) Ltd, which is a USA based company developing embedded systems and software platforms, he joined Dialog Axiata (Pvt) Ltd as a research engineer. Meanwhile he was working as a visiting instructor, and later as an assistant lecturer on contract, in the Department of Electronic and Telecommunication Engineering, University of Moratuwa. Currently he is a PhD research student at the Centre for Autonomous Systems (CAS) at UTS. His thesis topic is Magnetic flux leakage based condition assessment and failure prediction for buried underground pipes and his research interests include Electro magnetism, Magnetic flux leakage, Electromagnetic imaging, Machine learning, Mechatronics and Automation. Mr Freek de Bruijn received his B.Eng. in Electronics and Mechatronics Engineering from Fontys University of Applied Sciences, Venlo, The Netherlands in 2010. He joining the Centre for Autonomous Systems (CAS) at the University of Technology Sydney (UTS) in February 2010, first as a robotics engineer intern, and then as a Research Associate, a position that he has occupied since October 2010. Prior to that he was awarded an internship in 2008 to work at National Starch and Chemicals (Sydney), where he designed a power control system to minimize peak energy demands, and at Hauzer Techno Coating B.V (Venlo, The Netherlands), where he worked on oxygen flow controls of coating processes between 2009 and early 2010. Mr. Daobilige Su received his B.Eng. in Mechatronic Engineering from Zhejiang University, China in 2010. During his last semester of undergraduate study, he had an internship in Bosch Power Tool (China) Co., Ltd. as a manufacturing manager assistant. He joined EMARO (European Master on Advanced RObotics) program and obtained double master degrees from University of Genova, Italy and Warsaw University of Technology, Poland in automation and robotics in 2012. He is currently a PhD student at the Centre for Autonomous Systems (CAS) at UTS. His research topic includes machine learning, acoustics, robotics and signal processing. Ms. Liye Sun received her B.Eng. degree in Automation with First Class Honours and M.Eng. degree in Pattern Recognition and Intelligent Systems with National Graduate Student Awards from Northwestern Polytechnical University, China in 2011 and 2014 respectively. She joined the Centre for Autonomous Systems (CAS) at the University of Technology Sydney, Australia in 2014 and she is currently a Ph.D. candidate with the research topic of multimodal information fusion for advance condition assessment of ageing infrastructure. Her research interests include data fusion, computer vision, machine learning and image processing. Mr Raphael Falque received his M.Sc Engineering degree, in Electrical Engineering, from the INSA of Lyon, (France) in 2013 with a specialization in Signal and Image processing. After a 6 month internship at Stago on reverse engineering of automatons, he joined the Centre for Autonomous Systems (CAS) at the University of Technology Sydney (UTS) for a 5 month contract to work on automatic classification of body condition score of cattle using 3D images. Currently he is a Ph.D. candidate at UTS and his thesis topic is Automatic Data Interpretation and Enhanced Localization for Inline Remote Field Eddy Current Tools. His research interests include electromagnetism, remote field Eddy currents, machine learning, image and signal processing.